Well I wasn't expecting this - a collaborative project from 12k boss Taylor Deupree and expert guitar-manipulator Christopher Willits coming as if out of nowhere. Not nowhere exactly though, to be more precise it's coming from Japan, and this project was funded by the Yamaguchi Center for Arts and Media in 2004. Deupree and Willits were asked to provide a soundtrack for tea spaces in the Yamaguchi Center itself, designed to heighten vistor's senses as they sat in the beautiful rooms drinking tea or chatting quietly (see why it would never work in the UK?) and the musicians proceeded to craft short randomly-sequenced pieces to mirror the mood of the place. 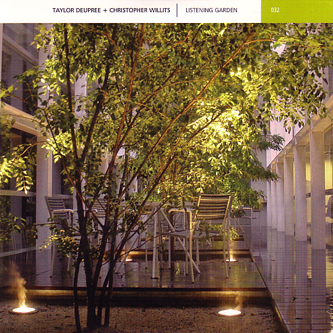 Taking the sounds of nature as a template Deupree and Willits manipulated the recordings accordingly making sure they never sounded overtly digital or removed from life (as so much digital, minimal music can be) and this album itself is actually environmental recordings rather than the tracks themselves. Occasionally you hear the clink of a teacup or a hushed whisper, and the slow breeze is constantly caressing the microphones as they record, but this doesn't distract from the enjoyment of the music itself which ebbs gorgeously in the background. You might hear a rhythm for a second, the subtle pulse of Deupree's electronics and then the hum of Willits' processed guitar but everything is fleeting and dissolved into the rich atmosphere. This is both field recording and minimal music, and those slightly frightened by the record's placement on ultra-minimal offshoot label Line shouldn't be, 'Listening Garden' is like reclining into a gorgeous pillow of sound, relaxing without being audio wallpaper and absorbing without resorting to clichéd digital trickery. Easily one of the finest bedtime albums I've heard this year, and something I'll be playing a lot more in the months to come. As usual the Line cds are limited to a one time pressing of 1000 copies so make sure you buy quickly if you want to secure yourself a copy, there's not much chance we'll be able to get restocks on this. Sublime.